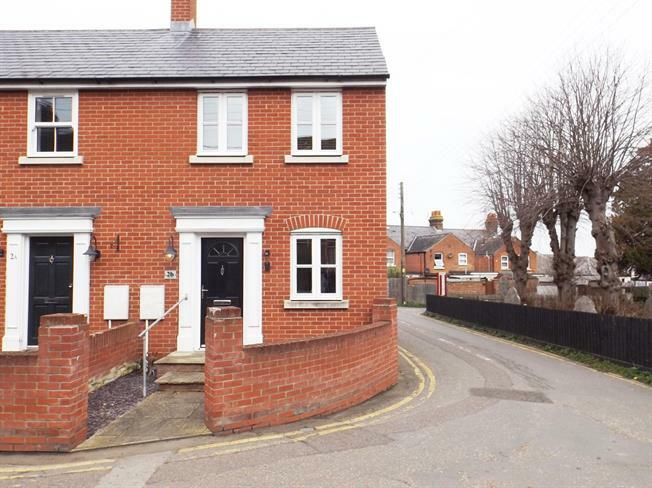 2 Bedroom End of Terrace House For Sale in Colchester for Guide Price £210,000. Two bedroom end of terrace house with welcoming hallway with door to fitted kitchen, and lounge/diner looking out onto garden. The upstairs has two double bedrooms and a double shower room. At the rear the garden has patio area and artificial grass with flower boarders and door to carport. UPVC double double glazed door. Radiator, laminate flooring, under stair storage. UPVC double double glazed door. Double glazed uPVC window facing the rear overlooking the garden. Radiator, laminate flooring. Double aspect double glazed wood windows facing the front and side. Radiator, laminate flooring. Roll top work surface, fitted and wall and base units, stainless steel sink, integrated oven, gas hob, overhead extractor, space for. Radiator, vinyl flooring. Low level WC, double enclosure shower, pedestal sink.